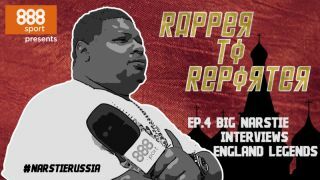 Big Narstie puts his interview skills to the test in the latest part of his training to turn from Rapper to Reporter with 888sport during this summer’s World Cup! BT Sport’s Lynsey Hipgrave is on hand to guide Narstie through the art of the interview – safe to say, it wasn’t a ride without a few bumps! This is just the latest in a series of challenges Big Narstie needs to overcome if he’s to earn a gig as a reporter in Russia this summer, having already got commentary tips from Barry Davies, learned Russian culture with folk band Russian Tornado and picked up the lingo at language school.